One of my favorite artists to emerge over the last couple of years, V.V. Brown, recently dropped a new single and announced details from her forthcoming sophomore record, Lollipops & Politics. FINALLY! After hearing her for the first time in the summer of 2009, it's been a fast road to obsession for me. I've seen her live twice in Boston (once as the headlining act, once opening for Little Dragon) and turned on countless friends to her unique voice and funky style. There's just something alluring and engaging about V.V. and everyone seems to agree with me. Following the release of her final single off Travelling Like The Light, I was ready for new music. By that time I had already listened to her debut album ALMOST to the point of getting sick of it, so some new tunes were much needed. Of course, I realized this would take a while, given her heavy promotional schedule and various tours, opening for the likes of Little Dragon, Maroon 5, Owl City and P!nk. Well, the wait is now over! New V.V. Brown music is HERE and more is on the way. First single, "Children" was released September 20th in the U.S. featuring U.S. rapper Chiddy, 1/2 of Philadelphia-based rap duo (and Capitol Records label mates) Chiddy Bang. The aggressively catchy single was produced by Chuck Harmony, a man behind hits from the likes of Rihanna, Mary J. Blige and Ne-Yo and has been described as "a hip-pop classic, with one ear cocked to Kelis' 'Milkshake' and the other to T.Rex's 'Children of the Revolution.'" The song was written about the materialistic nature of CHILDREN in this day and age, where possessions equate happiness. According to V.V., "It's pop, but that doesn't mean it can't be interesting." Well put Ms. Brown. During Brown's extensive touring schedule, she started to map out what would eventually become Lollipops & Politics. According to V.V., "I set up a studio in my flat, with just me and my engineer, and started going a bit mad with music. It was all part of the process of getting to where I am now. I had to re-program and learn who I was again." In discussing her morphing sounds, Brown explains "I was going to the kind of experimental place I hadn't been before. It felt like growing up. I felt freer." 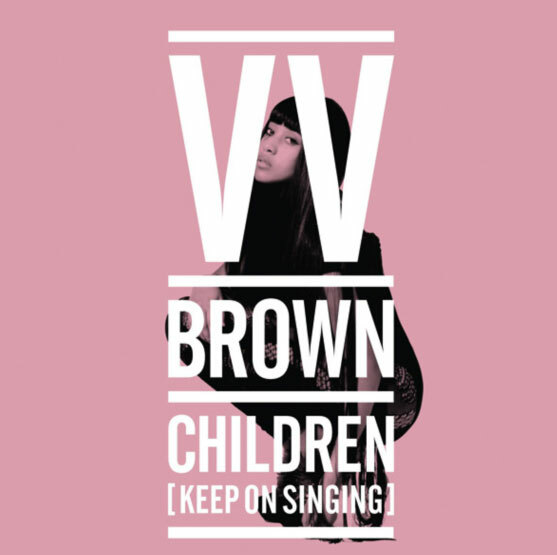 While "Children" is definitely different than anything Brown has released before, it's not that far of a stretch. Travelling Like The Light was full of semi-unconventional pop songs, with a few exceptions of course - her biggest hit "Shark In The Water" being one of them. Aside from "Shark In The Water," all of Brown's other singles ("Crying Blood," "Leave!," "Game Over") released in the UK were unconventionally POP, so "Children" is sort of a natural progression if you ask me. On Lollipops & Politics, Brown worked with writers Evan Bogart (Beyonce, Adam Lambert), Jean Baptiste (The Black Eyed Peas, Chris Brown), Mr. Griffiths (Jem) and writer/producer Bjorn Yttling (1/3 of Swedish indie rock band Peter Bjorn and John). The album includes a Ronettes-style ballad ("Be Yours"), a "fuzzed out discordant synthesizer"-lead "Like Fire" and "Famous," co-written by Yttling. From the sounds of it, Lollipops & Politics is as diverse an album as they come. The album is due out sometime in early 2012 via Capitol Records. Download "Children" on U.S. iTunes HERE and scope out the tracklisting and some tour dates below. Make sure you check out the 'Behind The Scenes' video below featuring "Children." Get ready for new V.V. Brown folks!